How does a new marriage in a new geography change the landscape of self? How does one woman find what it means to live in Alaska? This collection begins with the speaker, one week married, stepping aboard the Alaska State Ferry Malaspina as she embarks on her new life in the North Country. The poems, loosely narrative, follow her struggle to navigate the new country of marriage, and to speak the new language of self, in a land of reinvention. Like a shapeshifting salmon reaching its birth stream, the speaker reimages herself, to make a new place as familiar as home. Emily Wall studied poetry at Colby College and received her MFA from the University of Arizona. She currently teaches creative writing at the University of Alaska Southeast. Emily has published in a wide variety of literary journals and has won several poetry prizes. She and her husband live in Douglas, Alaska. I am filled with envy. Most Americans don't realize that living in Alaska is a completely different experience from living in any other state. "Freshly Rooted" is Emily Wall's reflections through poetry about adapting to the whole new world that is the coldest state of the Union. Her narrative reflects on how every aspect of her life changed, and how she learned to love it. 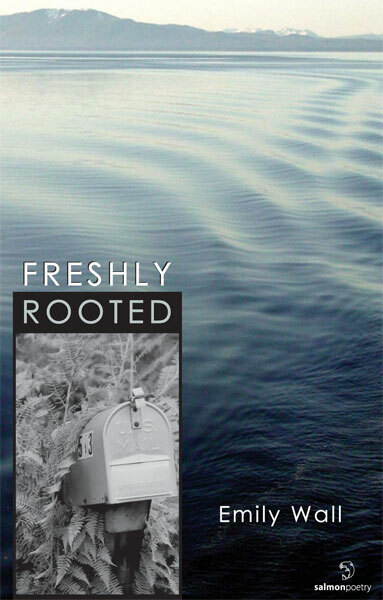 "Freshly Rooted" is a must for any poetry fan curious about Alaska. "Poem After Bathing": That full flesh moon -/can you see her?-/some soft abdomen,/that spoon of cream/coming out/brimming tonight/able to pray, belly/bared to the black coffee/night, delicious because she/believes it, makes it so,/swallows her sky full. You have complete permission to utilize the review in any manner you deem useful for marketing and promotion. Assuming your book is registered with Amazon.com I have instructed our webmaster to post the review there. Incidentally, although our bylaws prohibit accepting money from authors or publishers (in order to avoid any conflict of interest issues), we did amend it to allow authors and publishers who wanted to make a gesture of support and appreciation for what we try to do here at the Midwest Book Review in behalf of the small press community to donate postage stamps "for the cause". So if you'd like to send a check or money order as a donation to our Midwest Book Review postage stamp fund, please feel free (but not obligated! ).